Al-Azhar is one of the oldest educational institutes in the world, built on the foundations of knowledge and faith with the aim of enriching the population through the love of God. Its services to humanity are countless and the great men and women it has produced have been a great service to human civilization. Before coming to Egypt I knew it was one of the places I had to see. I have been blessed to pray Jumu’ah in many different places before, but very few of those places compared to this. 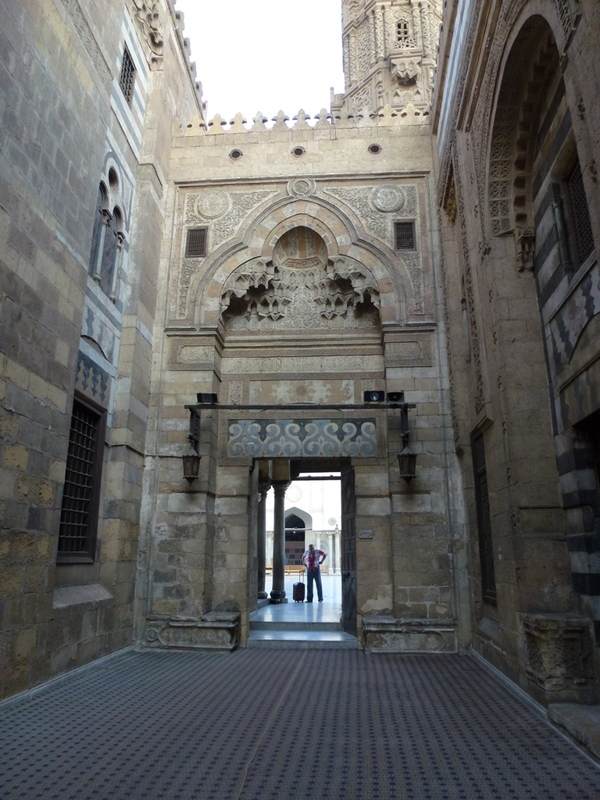 The feeling of tranquillity and peace immediately comes over you as you enter through the archway of the 1200 year old building, a world away from the busy streets of Islamic Cairo outside. On the other side; a courtyard kept clean and gleaning in the hot summer sun. A humble notice board with a tattered timetable stuck on it is the only point of congregation as students and members of the public note down which talks they wish to attend. All this seems a world away from the personalised timetables delivered by email at university back home – a reminder of the struggle which is required to gain knowledge. Before long, the adhan resonated from the minarets, signalling to all those outside that the sermon was due to start soon. Under the former dictatorship, all speeches at mosques were regularly observed by members of the secret service, heavily censoring anything that could be said on the pulpit. I wondered how different this post revolution Egypt sermon would be. Would the Imam now be free to address the many problems affecting Cairo at the moment (as it was just a week or so after the last protest where the Israeli embassy had been attacked) or would he play it safe and give a generic sermon? To my surprise his address was very much a bit of both, tackling the many issues Egypt was facing whilst giving poignant advice and stories with which people could relate too, something unimaginable just 6 months ago. This was not unique to Al-Azhar. In a local mosque I had prayed in previously the imam had openly stated the characteristics of a good president for the country and openly invited members of the congregation to attend a public meeting to discuss what reforms were needed in the area. These were truly unprecedented times! Soon the prayer was over and people returned to their daily business. I stuck around for a while to finish off a book I was reading and wait for the crowd to die down. 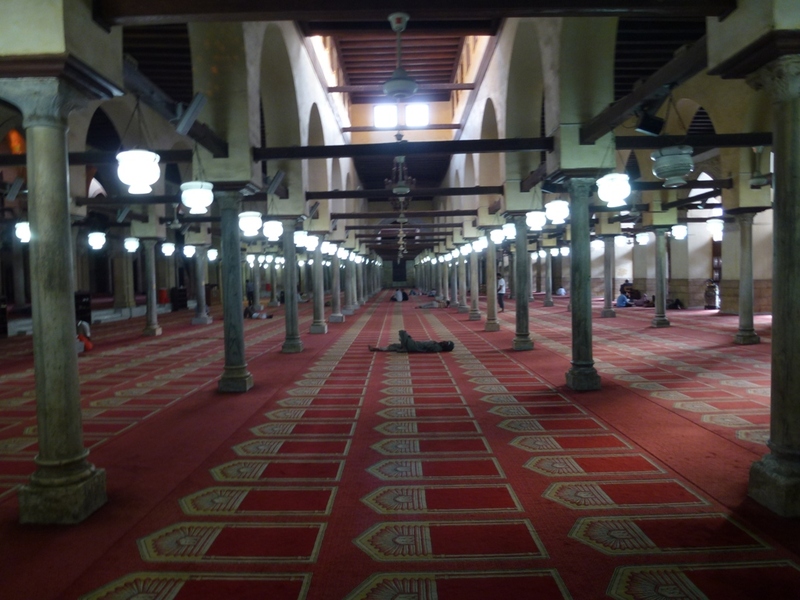 The mosque quickly transformed back into its serene and tranquil self as people lay down for a short Qayloolah (siesta) all over the mosque. The only sounds to be heard were the slow beats of the fans as silence and tranquillity filled the mosque once more. After a while I made my way across the road to Masjid Hussein – a large mosque built next to the grave of the head Hussein, the grandson of the Messenger ﷺ. His story and death is one of the darkest moments of human history as his body was decapitated after his death leaving his body in Karbala and head in Cairo. In his honour, thousands come and send their Salaams to the ‘master of the youths of Jannah’, full of love for the family of the messenger ﷺ.
Masjid Hussain could not have been contrasted more with Masjid Al-Azhar. From the outset you are met with crowds of people as everyone from shoe shiners to perfume sellers eagerly clasp you by the arm to make their ‘sale’. After you eventually wrestle past the ‘merchants’, your met with a sea of songs and praise from all quarters of the Masjid in praise of their prophet ﷺ and his family. Never have I been in such a spiritual environment so full of joy and happiness, buzzing full of activity from men giving away free sandwiches as charity to people sitting against the pillars meditating. Each couplet that was sung echoed through the masjid to be met by eager listeners who enjoyed the eloquence of the words they heard. 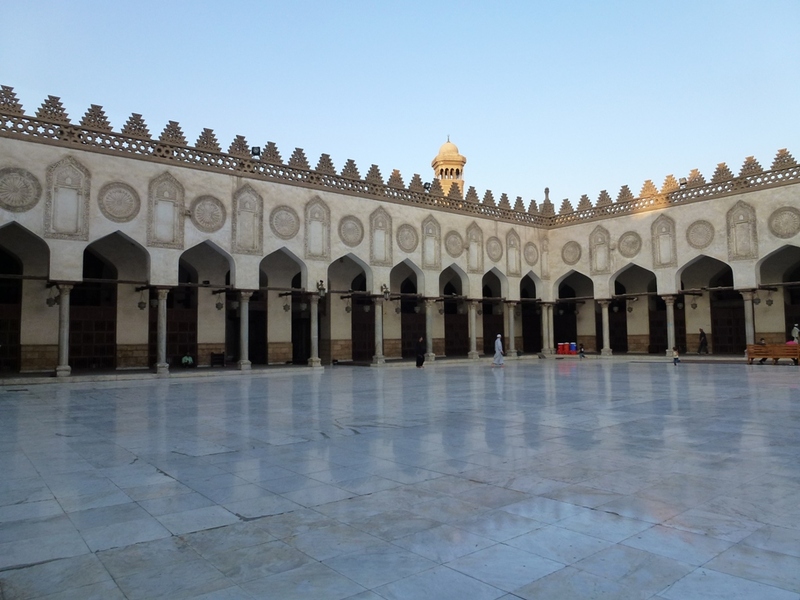 Though the mosque was completely different to Al-Azhar, it still carried that same feeling of peace and tranquillity which manifested most through the faces of those within the mosque. It’s a feeling that’s impossible to describe – something that you simply have to be a part of to understand why such gatherings are so blessed. As I sat down and listened to one particular group singing a song along the lines of “Our Master Mohammad is the moon…”, it struck me how within such a small area of Cairo you could get such a massive contrast in faith and practice yet everyone harmoniously got on. How often do we struggle in our relationships with our families and communities because of differences in faith and practice, yet here was a community which housed so many different varieties of practice but all accepted each other in peace. Each had their evidences and reasons for what they were doing and left to do what they wished. Tomorrow is another Friday in Cairo and another mosque to be visited, but few will ever match the same environment that Al-Azhar has to offer. The congregational Friday prayers held every week.